In target shooting, getting the bullet holes on point is of utmost importance. A spotting scope ensures you score a target at any range. That’s why it’s a fantastic investment to help you make the most of your shooting. 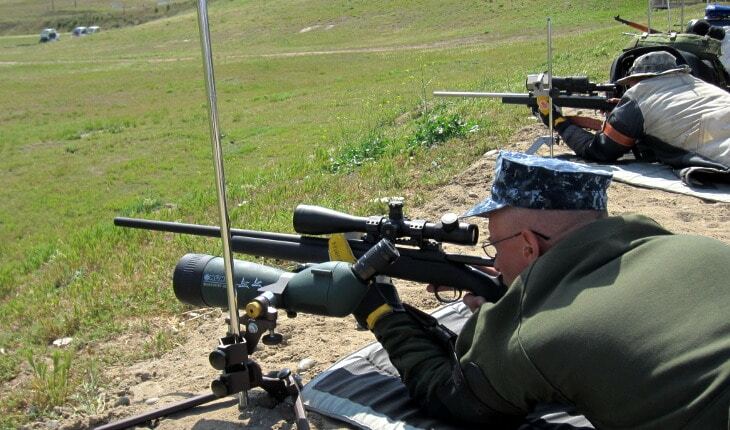 Most target shooters are at a loss describing the best spotting scope for target shooting, as the qualities and features vary quite a bit, for example, the best spotting scope for 100 yards, is not close to that for 400 yards. 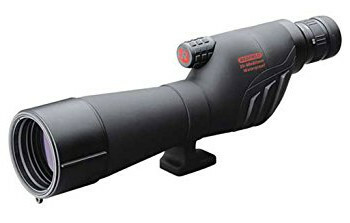 Spotting scopes are exceptionally designed with superior features such as a premium quality of magnification and objective lens than other vision enhancers such as the monocular and binoculars.They are usually designed to mount on a tripod to stabilize them so that you can target your shots accurately. You can even install them on your car. 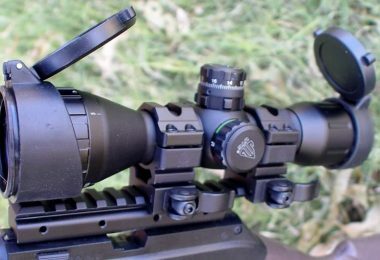 There are, in fact, numerous designs of these scopes, and we have chosen a few ones that our critical evaluation found them to be the best on the market. We know that it can be daunting to find the best spotting scope you need if you do not know where to look or which features should you pay attention to. Note that spotting scopes are used in a variety of ways. But the bottom-line is their excellence in magnification over other scopes.They have developed to the extent of even attaching cameras to them using adapters so that long range images can be captured. In this industry, it’s true what they say; you get exactly what you pay for. 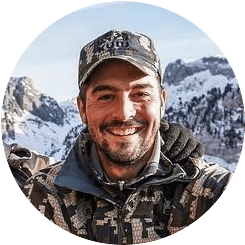 Before we can review the best spotting scopes for your target shooting, we would love to discuss the features of paramount importance in purchasing these scopes. There are plenty of features, some of which you do need and others you don’t.Of prime importance are the magnification, focal lens quality and size, eye relief, prism, and the design of the spotting scope. We have the angled and the straight body design of these spotting models. You will notice these types of our handpicked products. The main difference is the convenience with which one can maneuver them and shoot with precision. The angled body design, for example, is convenient to spot targets across flat grounds or look them up. It would be practical if you mount it on a car or your window. On the other hand, the straight body design is most suitable to view from a summit down the slope. It depends on your preference that which viewing angle is more appropriate for your spotting needs. Spotting scopes are renowned for their exceptional magnification. Most of them have a range of magnification from 30x to 40x for clearer images. But the magnification alone doesn’t guarantee a premium quality. The quality of the lens should also be taken into account. The higher magnification may produce blurred images. Even the atmospheric conditions such as humidity, high winds or dust can affect the quality of images regardless of how good the lens and the magnifications are. To compensate for such inconveniences; good scopes seldom go beyond the magnification of 60x. The objective lens is one of the essential features of the spotting scopes. Do not be tempted to only focus on the size of the objective lens without considering the quality of the lens. Going for the great combo of large objective lens and quality lens will surely make your spotting needs exceptionally great.The Smaller objective lens of good quality outsmarts a large objective lens of inferior quality. But, you must be prepared for the high price to pay as a result of the large objective lens of premium quality. Prisms are integrated into the spotting scopes to flip the image right side up or left to right. 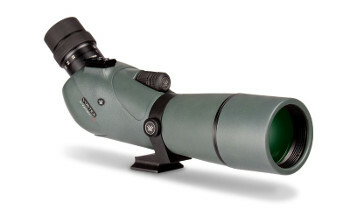 The scope may have the Porro or roof prism whereby the roof prism doesn’t have the option to change the eyepieces. It is however very portable and slim to hold it comfortably. The Porro prism is less expensive of the two. So, if you’re running out of the budget, you might consider the Porro prism. This defines the distance between your eyes and the eyepiece. Most people with protective eye glasses will find it convenient to have the adequate eye relief. An insufficient eye relief will prompt you to take off your glasses, particularly if they have thick lenses so that you can view through the eyepiece. It is recommended that your scope should have a minimum of 14mm of eye relief. At times, you might have the flexibility to interchange the eyepiece. But some do not have that option. Interchanging the eyepiece helps one to fit the one with the desired features such as the zoom capability and quality magnification. To find out if the scope grants you a chance to fit your desired eyepiece, you check if the price is all-inclusive of the eyepiece. If excluded, then it means that the eyepiece can be detached. Most of these spotting scopes are supported by tripods to keep them stable and steady during use. We can’t rely on a car mount because not everyone does have a car. Tripods are portable and can be packed to travel to any place. However, you have to match the weight of the scope with the tripod if the scope in question doesn’t come packaged with one. Get a heavy tripod to support a massive scope. This is important whenever selecting the spotting scope. The lens can be multi-coated or fully coated to optimize the viewing experience. It is an essential factor when viewing targets at higher magnifications.So, you should also take that into account because the lens coating enhances the light transmission so you can see crystal clear images. The premium quality of the light transmission thus depends on the type of surface you’ve chosen. Other features include the waterproofness or the fog proofing of your scope so that you can enjoy spotting targets amid the harsh climatic conditions. These are however not that critical when purchasing your spotting scopes. The other worth noting features also include the close focus and the availability of camera adapters. As we have highlighted, today’s spotting scopes help us capture images at long ranges with the use of camera adapters. Now that you have a good idea of features to look for; let’s get into the product reviews of our best scopes on the market. 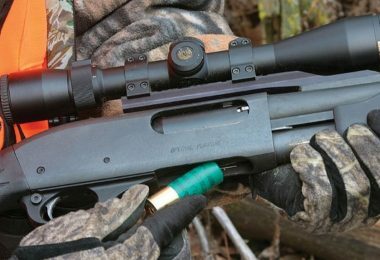 Now that you know what to look for in a spotting scope that is aimed at target shooting, let’s zoom in on some of the best options that we could find. As you go through each one remember to think how each will integrate into your given shooting style. Specific features: Multi-layer Prism coating, eye relief of 20 mm, linear field of view 140-65/1000 yards, magnification range of 14-45x, objective lens diameter of 6 5mm. 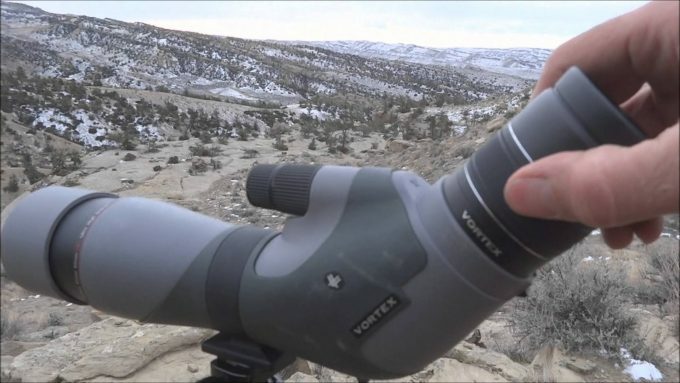 The Vortex Viper Spotting Scope is an excellent addition to your outdoor hunting tools. The scope comes equipped with exceptional quality features that are indispensable to seeing crystal clear images in low light conditions, thanks to its magnification ranging from 15 to 45x and its quality and the full diameter of 65mm for the objective lens. You will be able to see great images at a long distance with a field of view of 140-65 ft/m per 1000 yards. And for a bright and crisp image, the Prism has a multi-layer coating. These layers are responsible for preventing the sun’s glare; hence you’ll have sharp images each time. With a weight of 53.3 ounces, this is a portable spotting scope. Feel free to operate with it in unfavorable weather conditions because it is fog and water resistant. The manufacturer provides the unconditional lifetime warranty should you experience any defects using the scope. Related: To make this spotting scope steady and stable, the manufacturer sells the compatible Vortex Optics Summit SS-P Tripod separately. Also, for use on your car, there’s the Vortex Summit Car Window Mount. It comes with the ball head to improve stability and allow for constant rotation. 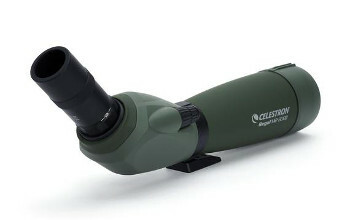 It makes this spotting scope even more portable since it is lightweight in itself. It folds to a compact size so that it will fit nicely into your arsenal. 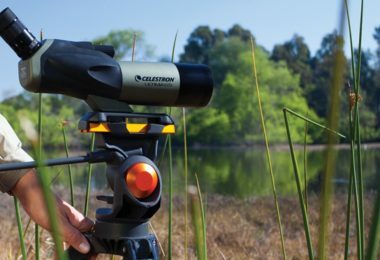 This Celestron Regal M2 LER brings you the pleasure of spotting your target at long distances. This is because it has a linear field of view of 110ft/37m per 1000 yards. Its diameter of 80mm lets in sufficient light to view quality images. With the T-threads on the indispensable LER (Long Eye Relief), you can attach your camera and use it in conjunction with the scope. It also provides a 32mm of eye relief, so you won’t have to remove your protective eyeglasses whenever you want to spot your target. Operating this spotting scope is effortless with its impressive lightweight and compact magnesium design. It has a dual focus mechanism with a fine and coarse focus. To enhance the quality of the images and transmission, it comes with multi-coated lenses. Meanwhile, the wide field of view helps the enthusiast to view objects quickly and conveniently. The waterproof feature protects the scope against the unfavorable climatic conditions. Related: For those for zoom eyepiece, the manufacturer gives you the option to interchange and perhaps consider the Celestron Zoom Eyepiece for Regal M2 (Black). When you remove it, you have the option of attaching the DSLR camera to the spotting scope. This is a versatile piece with twist-up eyecup for a comfortable view. You’ll also want to consider the Celestron Altazimuth Heavy Duty Tripod. It provides a stable base thanks to the aluminum legs. It allows for slow-motion setting with the flexible cables. The USCAMEL Bird Watching Spotting Scope comes with the portable and glamorous handheld tripod to make the scope steady whenever using it. Meanwhile, the camera adapter enables you to also capture amazing images at long range at a magnification of 20-60x. 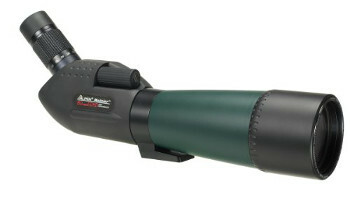 The scope has an angular design body with a powerful zoom capability and fully coated lens. The FMC full broadband coating technology gives you the privilege to zoom on target easily. The multi-coated optics and wider objective lens enhance light transmission for more crisp images in low light conditions. The fully-coated optical glass reveals the image details. The hard side aluminum case and the soft carrying case are included to help you travel with your outdoor tool. An English operator manual is also included to help you understand the features and how to use them. Related: Nothing makes it better if you can combine this scope with the USCAMEL 50mm Dial Professional Metal Compass. You can do even better estimations with its reference table. It has a sighting window with sighting lines. The uses do not stop in target shooting as it is also meaningful for hiking, camping, and other outdoor adventures. Its bright display allows for viewing even in the dark. The Celestron C5 Spotting Scope brings you the joy of aiming and shooting at your target with its great 50x magnification and 25mm eyepiece. 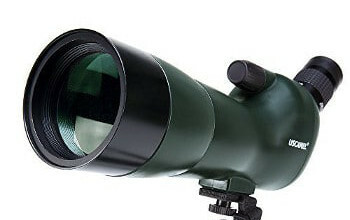 It is a high performing spotting scope with an effective focal length of 1250mm. It applies the Schmidt-Cassegrain optical system which is perhaps a unique entity of this unit. It gains a long focal length which is the main attraction when one wants a narrow field of view like in bullet-hole acquisition and deep sky viewing. This system also gives the scope a smooth body hence it is compact and portable. The exciting part is that you can mate it with the professional camera to take amazing images by just adding the T-Adapter and T-ring to the rear of the scope. Then all will be set with your SLR camera to capture spectacular moments in the adventurous wilderness. It makes professional photography quite a bit easier. Related: To enhance your vision even further; the company has the Celestron 93230 8 to 24mm 1.25 Zoom Eyepiece as a separate purchase. Zoom eyepieces are great to see even more details of your target. 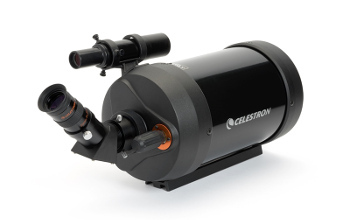 To extend you capabilities even further, you’ll want to invest in the Celestron Accessory Kit. It has a wide array of eyepieces with some as planetary filters. The value and the price you pay is a total steal since if you were to buy the items separately, the cost would skyrocket to over $700. It has two 1.25Barlow lenses to expand the power to ten combos and a 1.25inch bright moon filter plus six other planet filters. With the FireField Spotting Scope, you get a wide magnification range and elegant design that boasts an unmatched technology from its predecessors. It’s an indispensable trail tool that you can take anywhere to spot your targets. It’s also a versatile tool in that you can mount a professional camera for a magnificent digiscope image. But the camera mount is sold separately. Meanwhile, the nitrogen purged weather resistance protects the scope against rainy conditions. You’ll like the built-in sunshade to help mask your position if you are into taking down live targets. The fully multi-coated lenses and a comfortable eyepiece are great tools to help you see a clearer target in a wider field of view. The quick focus knob also comes standard. Traveling from one place to another is made easy with the included nylon and hard case to store this spotting scope. 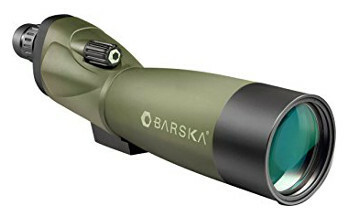 Provided with a case and the tripod, the Barska Blackhawk Spotting Scope is simply the most convenient option on the market today. The tripod had the rotating collar to position the scope in a desired position. Meanwhile, the impressive magnification range of 18-36x can help you capture more details of your target and shoot precisely. The objective lens diameter is 50mm, large enough to gather enough light. The light transmission is enhanced by the multi-coated optics in any weather condition with the featured water and fog proof. 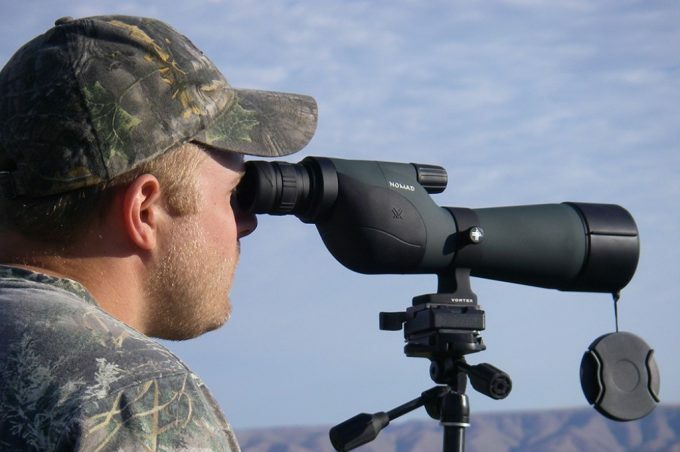 Whether you’re hunting or just viewing the picturesque landscapes from the summit, this spotting scope is an excellent tool that will not disappoint you. It has an extendable sunshade to reduce glare when spot shooting. Related: Barska offers many accessories including this incredible Metal Table Top Barska Optics Tripod. It has a pan head design which is perfect for providing a stable base for this scope including video cameras and binoculars. The feet are fitted with rubber to provide anti-slip properties on rough surfaces. Are you thinking of shooting targets at long distances as well as capturing exotic moments away from you? The Leupold Ventana is the best tool for you. It comes with retractable lens shade and multi-coated optics for crystal images. The rugged waterproof construction helps you operate the scope effortlessly amid the inclement rainy days, while the impressive magnification range of 20-60x provides you excellent and bright images. It comes with a center smooth focus knob for fast sighting in at whichever distance you. The varied zoom options do not compromise on the imagery even at the highest power. It perceives objects with better detail thanks to the smart engineering of the lens glass. 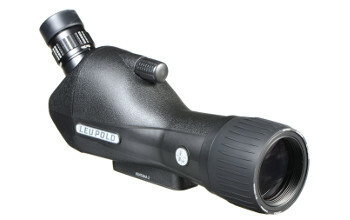 Related: To clean up your scope’s lens, the company has the Leupold Lens Pen 48807 for best service. It uses a two-step cleaning method that is useful for both binoculars and riflescopes. This lens pen uses a microfiber cleaning tip that leaves no streaks or marks after wiping the lens. It retracts fully when it’s not in use making it convenient for carrying everywhere. The Alpen Rainier Spotting Scope is a versatile spotting scope that you can hardly define its use from target shooting to hunting. It comes with a whopping 20-60x magnification range to see clearer details hard to see with the binoculars or monocular devices. The fully multi-coated optics provides a bright and crisp image. With the rotating collar on the tripod, you can adjust the spotting scope to any desired direction. When shooting on sunny days, there is the extendable sunshade that is also fog and waterproof. To capture great moments, there is the option to attach your SLR camera and start enjoying professional photography. But you have to purchase the T-mount separately that is compatible with your camera brand. Your target shooting will be tremendously enjoyable with a field of view of 96ft to 54ft and the eye relief of 17mm so you can operate without taking off your eye glasses. Related: To mount this scope onto a camera, you’ll need the Alpen Optics DSLR Camera Adapter. It is unique to Rainier Spotting models with a sturdy aluminum construction. You’ll find it interesting as it transforms the Alpen 84Ed and Alpen 856Ed into a telephoto lens system for the DSLR camera. Also, there’s a useful Car Window Mounting Device by Alpen. It has a quick attachment mechanism for the top edge of the car’s window glass. It uses the standard mount to fit on to all scopes and binoculars. 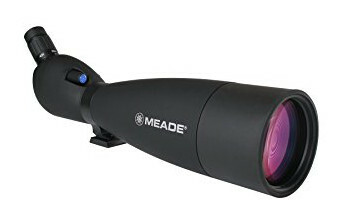 The high-quality Meade Instruments Spotting Scope delivers the powerful Zoom Porro prism binoculars to view varying angles of your images. It boasts a large 100mm diameter of the objective lens that helps gather plenty of light to unfold even the finest details of your target. The lenses are coated with multi-layers of anti-reflection coatings, while the 20-60x magnification range delivers a better focal range at long distances. The ground lenses provide great optical performance better than what you’ll get from other spotting scopes its class. It has a sliding sunshade to reduce the sun’s glare, give you bright images and provide a means to hide your position. To store your scope; the soft case has been included. The camera adapter enables you to attach the camera of your choice so that you can capture images at long distances regardless of weather conditions because of the water and fog proof features. The lens cleaning cloth is included to clear off the dust on your lenses for crisp images. But you have to purchase the T-mount separately. Related: Meade provides a means for you to interchange the eyepiece with the Meade Instruments 2xShort Focus Barlow Lens. It measures 1.25 inches which is great aperture to improve the eye relief. It allows users with glasses to feel comfortable and achieve a full view of the image. The lens is also multicoated hence high contrast against bright backgrounds can be attained. The Redfield Rampage Spotting Scope comes with a powerful magnification range of 20-60x to view targets hundreds of yards away. It has a straight eyepiece to have a great viewing experience from the top of the mountains while a 60mm objective lens gathers light. It has an extensive array of optical capabilities including BaK4 prism glass. This system gives full-color fidelity even as you explore the different zoom options. All lenses are fully multicoated and covered with multiple anti-refection layers. You can expect bright images with full details. When it comes to facing the outdoor extremities, it has a polycarbonate rubber armored housing to prevent degradation from water, dust, and debris. It provides for using the unit with the casing still on giving you the flexibility to not cut short your adventures. The exciting part is that the scope is among the cheapest with a price tag under $300. 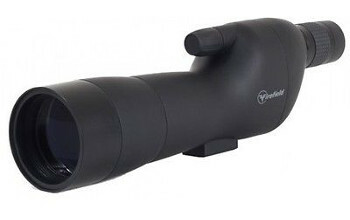 Related: To fully enjoy your view, you can combine this spotting scope with the Redfield Rebel Series Binocular. It achieves a full field of view at 341ft for every 1000 yards. You’ll love working with it as it has a center focus for quick zeroing in. The body is aluminum armored and texturized to provide a firm grip and weather proofing. 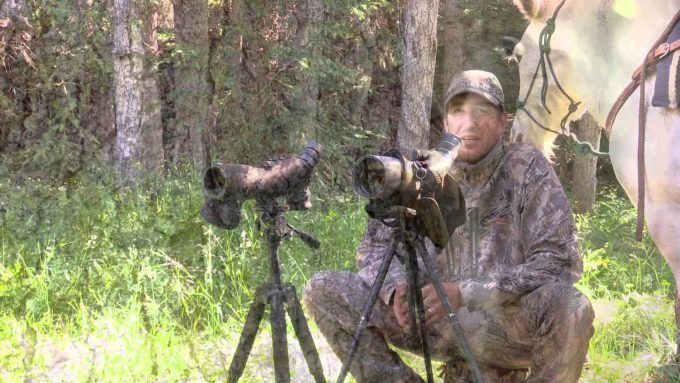 Now we’ve come to the end of our list for the best spotting scopes on the market. To this far, we believe that you’re well-equipped to choose the best one in line with the features we’ve discussed. But keep in mind that the best spotting scope comes at a hefty price.And the majority of these scopes have the option to attach the camera to digiscope images. However, with most of these spotting scopes, you’ll have to purchase additional accessories such as the T-mount and the camera adapters that were not included. Have you ever used any of these spotting scopes before? Please do share your experience with our readers below.